This book was provided to me by the publisher in exchange for an honest review. This in no way shaped or forms my opinions of the novel. Thank you Penguin Random House and the wonderfully generous people at Underlined for the opportunity. I know I'm in the minority of YA bloggers and fans in general when I say that I've never read a book by David Levithan before. His books are ubiquitous in this genre. And I also know I'm in the minority when I say I also never read Nick & Norah or Dash & Lily. These books are wildly popular as well. This book came to me via Underlined, Penguin Random House's community for YA readers. I didn't get to go to BEA this year because my cancer has had a very strong recurrence and I can't travel right now because I'm sicker than I've ever been and we are struggling to find a chemo that works that my liver isn't being poisoned by. I contacted them in hopes of obtaining a few of the ARCs I was missing and not only did they send me those books, they sent me a GIANT box filled with hardcover titles and book swag -- a tote bag, a pouch for it, a t-shirt, the movie Everything, Everything (based on the YA book by Nicola Yoon), Kindle external battery chargers, and more. I had just finished reading Sadie by Courtney Summers and wanted something light to read as kind of a palette cleanser and this seemed like a good, fun choice. It was exactly what I wanted and it also made me a little nostalgic and emotional. It gave me all kinds of feels. And I was surprised by how much I instantly liked it, because I caught a few of the reviews on Goodreads and they were mostly negative, even though many of them loved Cohn and Levithan's previous cooperative projects. I found the reviews to be way too harsh. I LOVED this book. It was a creative story with fully developed characters, which I think is an accomplishment given that the premise of the entire book takes place over one night and in one location. 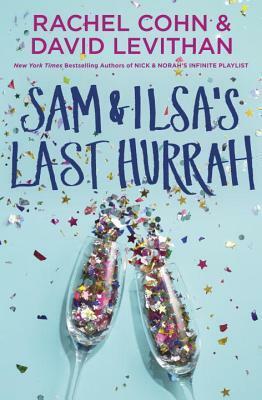 I got a very good idea of all the characters and who they were -- and they are all the guests at a party hosted by twins Sam & Ilsa, who are throwing one of their famed dinner parties in their grandmother Czarina's home in Manhattan, which she is selling so she can move to Paris. Most of the characters are also graduating imminently and many of them haven't really sewn up what it is they're going to do once they leave high school. I don't know how much you remember about being a senior in high school, but I remember feeling like I was a fully-formed, responsible adult, capable of making any and all decisions without much input from anyone. I was way too headstrong and I thought I was more mature than I actually was -- after all, I'm 32 now and I still don't feel like a fully-formed, responsible adult. How could I possibly have been one at 18? This book reminded me of all those feelings I had and all these crazy notions I had, even though the most adult thing I could do was vote, and otherwise, I was really just a baby. I thought Ilsa's voice was particularly strong and she had a very realistic teen voice and edge, without being whiny. Sometimes, contemporary YA narrators are super whiny. I didn't feel that way about Ilsa at all, or Sam for that matter. Sam & Ilsa are, as I mentioned, twins. And I know that it's pretty typical for one twin to be the "big" sibling or "Twin A" and the other to be a little more reserved. It's very clear that Ilsa is Twin A here. I also love any book set in New York City automatically a little more than other books. I've spent a lot of time in the city in the past few years and I consider myself a New Yorker in my soul. The first time I stepped out of Penn Station and onto the streets of New York, I immediately found what I've been looking for my whole life. So even though this book took place in a fictitious building, I still loved it. Of all the characters, the persons that annoyed me the most was KK. But I think that's kind of the point. You're supposed to feel like she's super annoying. She has her moments of brilliance and she's got an interested personality dynamic, but in general she kind of gets under your skin in am irritating way. I'm a big fan of the show Chasing Life, which was on Freeform, but it got canceled. Anyhow, there's a character on this show named Ford, and she is kind of who I imagine KK to be like. She's super rich, she's got a major attitude problem, she can bug the crap out of you and be compelling, all at the same time. And she thinks she's an authority on everything. So I had a very clear vision of her. I really felt the dialogue was perfect and appropriate for teens at this phase in their life. There wasn't a lot of what I call "Dawson's Creeking", where they use a lot of big words and overly mature dialogue that even adults don't use. This felt right for their ages and the pace of the novel was also really great. It moved along quickly. At one point the guests all have this really great conversation about lifeboats and how people can be your lifeboats -- the only thing keeping you afloat, especially if you have no idea what direction to go in your life and you feel like you're just ... there. With no sense of where you are headed or what the next step is. Sam, a musician who desperately wanted to go to Berklee in Boston and had his dreams snatched when he melted down a bit during his interview, is using lots of his friends as lifeboats. And he has no real concept of what's next for him. Everyone is moving on. And his only lifeboat left will be Ilsa and, as he points out, "she leaks ... when I weight too heavily on her." And he discusses needing more lifeboats. Let's be real here: We all do this. We all have people who are our touchstones, our anchors during the storm, people to reassure you, people to remind you of who you are. And at different points in our lives, we need those people more than other times. Sometimes, it's smooth sailing and you don't need a port in the storm. Sometimes, we need lots, or we need a lot from one person. There's something to be said for being independent, of course, but realistically people need other people. And I don't buy into that whole concept that you are the only person you can depend on. That kind of thinking isolates you, can lead to depression and anxiety, and just isn't realistic. There is no shame in needing other people. But at this particular point in Sam's life, he needs to figure out how to be his own boat a little. Ilsa: "I was born with bitchheart. Sam got all the good DNA." Li: "Maybe bitchheart isn't so terrible? It will make you a survivor." Also during another conversation later, Li and Ilsa talk about medication for Ilsa's anxiety and she says she's afraid it will change her. I personally am bi-polar type II and I was really afraid that taking meds would change who I am. I liked how real and vulnerable that moment was. But Li is open with her and tells her about her experience and how the medications just give her a lift and help her to be her true self with less anxiety, which is the real gift of psychiatric medications. There's such a stigma out there and I think it was great that it was talked about here. There were also a lot of moments where they talked about the great change that they were all experiencing. Johan, though, has already been through this and is a little more seasoned. He talks about fulfilling his dream of moving to New York and how he got there. I loved this quote so much, because I relate to that desperation to move to New York. Johan: "I always had the destination in mind -- the question was, how would I pay for the ticket? I don't mean literally -- although I guess there it's there literally, too. But I mean it more like, what's the thing that's going to get you from where you're stuck to where you want to be? And don't get me wrong, when I say stuck, I don't mean that that my parents were mean or my friends were lame. I loved them all. But I loved the idea of setting off, the idea of New York even more. And I realized my ticket was music. Even when I was twelve, thirteen, I knew it was my ticket. Not that I loved it more than my family or my friends -- but I knew that of all the things I loved in my life, it was the one thing that could travel with me." The book ends on an epilogue chapter that takes us ten years into the future. I won't share all the details of that because I think it's better left discovered, but I will say that I loved it and it did make me cry a little. It did just remind me of how fleeting that period of life is and how I felt like I was more grown-up than I was. All in all, I thought that this book really perfectly captured that time period in a person's life and dealt with authentic emotions, worries, fear of the unknown, heartbreak, so, so well. It was also a great quick read and even though I got a little emotional at the end, the book ends on a great high note. I'm just super sentimental lately. I would definitely recommend this book -- but if books about teenagers and that are written in that authentic voice bug you, don't say you weren't warned. If you happen to be older and you want something that will make you feel those feelings of nostalgia and also just read a really great story with some truly unique characters that are well-thought out and is a fun fast read, then you'll really love this. But if you ARE a teenager, this is a great read -- it will prepare you for this time in your life and maybe you'll take the opportunity to remember how young you are and how you will only experience your senior year once and that when you're young is the time to take a few risks and see where life takes you. But it will also remind you that you aren't as grown up as you think you are yet.